Swapping oatmeal into your morning breakfast routine may help protect against a number of health conditions, such as cancer, heart disease, hypertension, and diabetes. Oats are a nutrient dense food packed with protein (5 grams for ½ cup dry), fiber (4 grams for ½ cup dry), minerals, and antioxidants! Wash and dice the apples into small chunks. Chop the date(s). Add the fruit and cinnamon to a saucepan with a ½ cup of water and cook on medium-heat until the apples start to soften. Combine plant-based milk and water in a saucepan (you might do 1 cup water, 2 cups plant-based milk or 2 cups water and 1 cup plant-based milk). Once the liquid is near boiling, add in the oats. Reduce the heat to low. Cook for 5-8 minutes, or until the oats are soft. You may need to add more liquid as it is cooking. 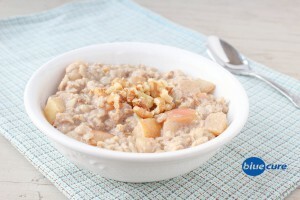 Add in cooked apples to the oatmeal. Optional to add in crushed walnuts, additional cinnamon or plant-based milk.